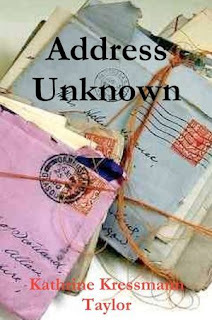 Address Unknown by (Katherine) Kressmann Taylor is a wisp of a book that’s as heavy as an anvil. It consists of a series of letters between two friends and business partners of an art gallery. Max Eisenstein is an American at their gallery in San Francisco, while his partner, Martin Schulse, has returned to Germany with his family after many years in the U.S. Their correspondence begins in November of 1932. When, in his January 1933 letter, Max inquires to know more about Hitler’s rise to power, Martin reports back in March that he thinks Hitler is good for Germany, but he is not quite sure. At that point, Martin even questions Hitler’s sanity. However, Martin’s letters soon change tone, and his support for Hitler grows stronger and he tries to break ties with his dear friend Max, who happens to be Jewish. Martin is no longer the man Max knew and respected. The letters take us to March of 1934, where it ends with an unexpected twist. This story, originally published in 1938 in a magazine called Story, caused quite a sensation. The issue in which it appeared sold out and readers began mimeographing copies to pass on. A year later it was published in book format. The author stated that it was a true story based on a few actual letters. The book is diminutive, smaller even than 84, Charing Cross Road by Helene Hanff, which is also a series of letters, though in a much lighter manner taking place in 1949, after WWII. Address Unknown is poignant, and although it takes no time to read it, it would take a long, long time to forget it.